Health reform • Wester says Utah leaders need to be "morally responsible." 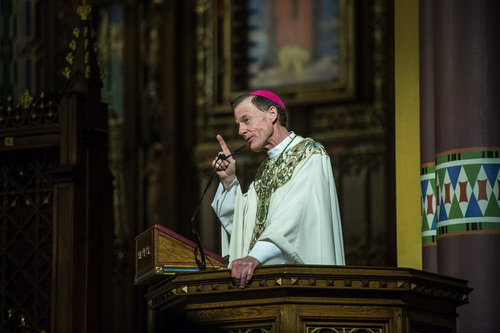 Chris Detrick | Tribune file photo The Most Reverend John C. Wester, Bishop of Salt Lake City, speaks during the Mass of the Lord's Supper at The Cathedral of the Madeleine Thursday April 17, 2014. 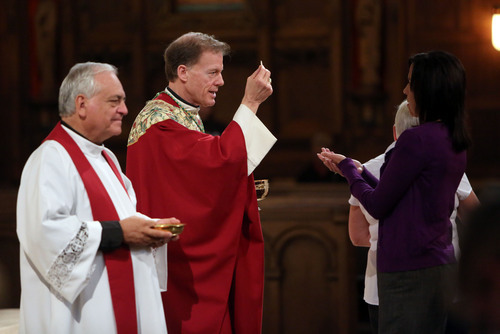 Francisco Kjolseth | Tribune file photo Bishop John C. Wester shakes hands with people, including representative Tim Cosgrove following a Red Mass for Justice at the Cathedral of the Madeleine in Salt Lake City on Friday, Oct. 11, 2013. Al Hartmann | Tribune file photo The Most Reverend, Bishop of Salt Lake City John C. Wester speaks at the annual Dream Builder's Breakfast in Ogden. 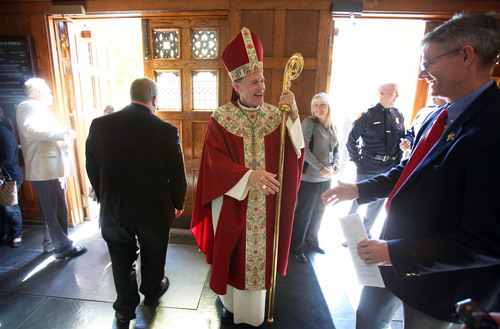 John C. Wester Francisco Kjolseth | Tribune file photo Pastor Martin Diaz, left, and Bishop John C. Wester hold a Red Mass for Justice at the Cathedral of the Madeleine in Salt Lake City on Friday, Oct. 11, 2013, for the legal community, including lawyers, judges, law enforcement and members of the military. 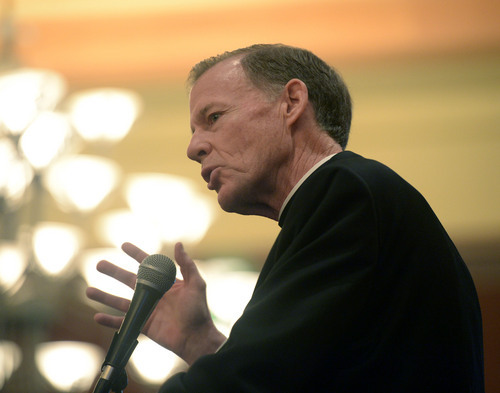 In a sharply worded editorial Friday, the head of Utah&apos;s 300,000 Catholics asked why in "a state that proudly proclaims its pro-life beliefs," political leaders are "frittering away" the chance to expand Medicaid. "Right now an opportunity to protect the dignity and sanctity of human life in Utah is being squandered by legislators who refuse to act in a morally responsible manner," the Rev. John C. Wester wrote in the Intermountain Catholic, a weekly newspaper published by the Salt Lake Diocese. "Utah cannot proclaim itself a pro-life state so long as it refuses to provide access to basic health care coverage to a significant portion of its citizens." Wester said he was motivated to speak out after GOP legislative leaders this summer declared there would be no decision on Medicaid until 2015, well after November&apos;s election. This news came despite two years of studying the matter and public opinion polls showing overwhelming support for Utah Gov. Gary Herbert&apos;s private-market alternative tapping public dollars to buy private coverage for 111,000 working poor and uninsured. "Legislative recalcitrance might be of little concern if there weren&apos;t thousands of Utahns suffering in the meantime. Whatever games legislators want to play, they are doing so with people&apos;s lives," Wester wrote. "Republican leadership in the Legislature refuses to accept the realities, the facts, the numbers, and asks for more studies. In essence, leadership is holding its breath until it gets its way." He&apos;s not the first religious leader to advocate for affordable access to health care. 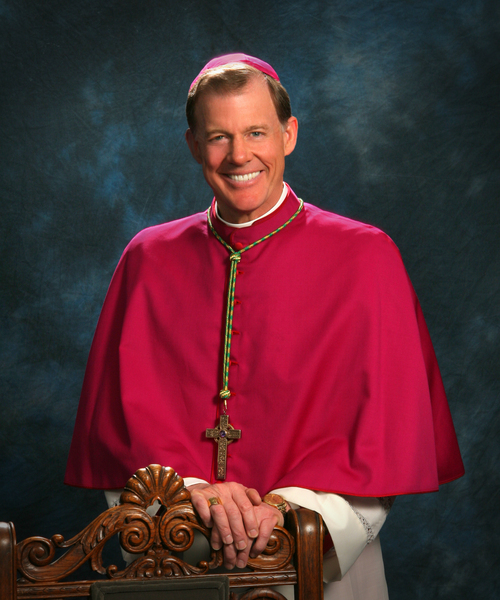 The Roman Catholic Church has pushed for comprehensive coverage for some time, Wester said in an interview. More than 100 Utah clergy signed an open letter to Herbert, endorsing the Medicaid expansion, an optional provision of the Affordable Care Act (ACA). The state&apos;s predominant, faith, The Church of Jesus Christ of Latter-day Saints, has not taken a position, but individual lay leaders have publicly acknowledged there are limits to what the church can do to address Utahns&apos; unmet health needs. Wester was emboldened to take a stand on such a politicized issue because, he said, "it involves human life and life is a God-given gift." He would like to see Utah embrace a straightforward expansion, but said he backs Herbert&apos;s idea as a "practical compromise" that would bring immediate relief to tens of thousands. "I respect that there are political overtones to this and big questions [about the proper role of government] that need to be discussed," he said, "but not when human lives are in the balance." Utah Gov. Gary Herbert wants to use public Medicaid dollars to buy private coverage for an estimated 111,000 Utahns with incomes up to 138 percent of the federal poverty level, or $15,856 for an individual or $31,322 for a family of four. Participants in his "Healthy Utah" plan would have to kick in an average of $420 a year toward their health care. Some would face a work requirement. Low-income parents whose children are on Medicaid could get financial help to move the whole family onto a private health plan. "On private insurance, they can probably get better quality of care and will have more insurance choices to fit their unique [health] needs," Herbert has said. "Nobody&apos;s getting a free ride; they&apos;ve got to put skin in the game. It&apos;ll make for a better program with better outcomes and give us better bang for the buck."